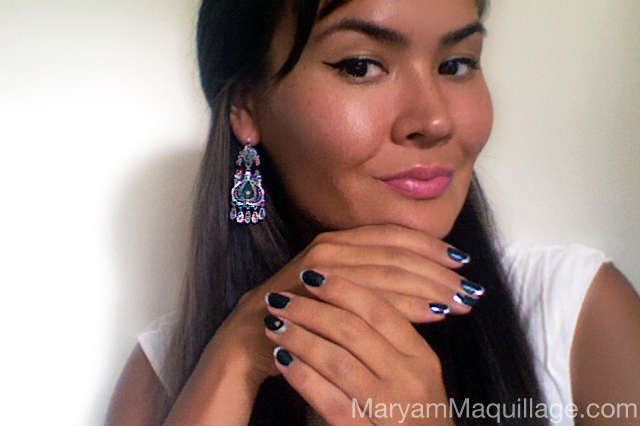 Maryam Maquillage: Green & Priti in Celebration! Not only are these Priti NYC nail polishes gorgeous to look at, but they are also completely non-toxic and made without toluene, dibutyl phthalate (DHB) and formaldehyde -- all known carcinogenic ingredients. The luxury polishes are fast drying, chip resistant, contain a UV inhibitor, and are extremely durable and glossy. They are also completely safe for use on children and moms-to-be. Available in over 100 different shades including metallics, mattes, bright neons, rich darks, classic nudes, and everything in between, limited color selection due to ecological restraints has officially become a thing of the past. Priti NYC Polish in Monkey Puzzle -- ON SALE for $10.50 (reg. $12.50) -- described as "metallic turquoise green with glittery specks", this shade is absolutely stunning and glamorous. If midnight was green, this would be its color! This polish is very shiny and two coats are more than enough for complete opaque coverage. Priti NYC Polish in Cape Sundew -- ON SALE for $10.50 -- If "silver glitter" was 'dropped in pearl milk', it would perfectly depict the description of this awesome versatile shade. This polish can be worn alone or as a finishing coat to create tons of cool glittery combinations. For today's design, I used it over a chrome silver polish. 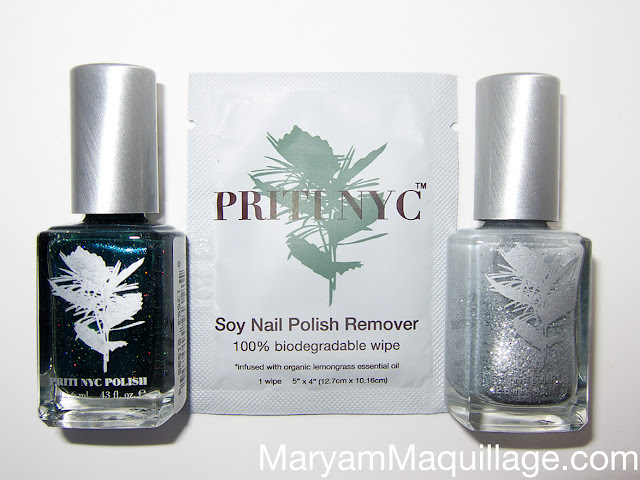 Priti NYC Soy Nail Polish Remover Wipes -- these 100% biodegradable wipes are infused with organic lemongrass essential oil to add moisture and nutrients to the nails and cuticles. I am so impressed with these wipes, I'm definitely getting myself a set for traveling, plus a soy remover bottle to keep at home. 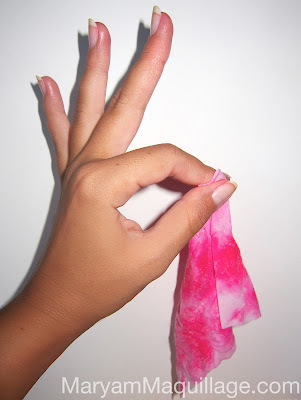 One wipe was enough to remove all traces of my old Neon Red polish in an instant; not to mention, the product smelled divine and left my fingertips nourished and moisturized. This stuff does the job so well, it is better than most of the non-green removers I've tried... no joke! On to the NAIL ART!! Did you know that Green & Silver are both symbols of Islam? For best results, start off by filing your nail tips to an oval shape. Apply your base coat and follow with two coats of Green Polish on all nails except for the accent nail with a half moon base. Wait for the polish to dry. SILVER TIPS: Use Silver Glittery Polish to paint strips of rounded tips. Doing so in one swift stroke helps to keep the edges smooth. HALF MOON BASE: Use two coats of the silver polish to either cover the entire nail or just the bottom portion using a fine striping brush. Wait for the polish to dry and paint two coats of the green shade a couple of mm's above the root of your nail, allowing the silver to show. Try to keep the base of the green polish similar (in shape) to the root of your nail. This creates a crescent form. 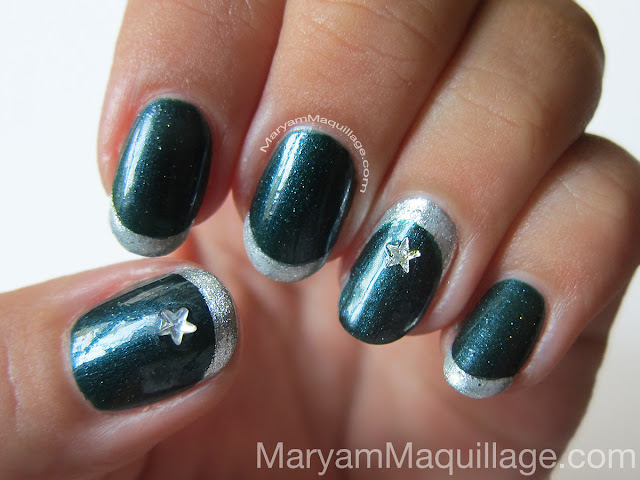 Complete the design with rhinestone and/or glitter stars on the accent nail and another nail of your choice (see thumb). Finish the manicure with a top coat. This sounds like you had an awesome week!! So jealous lol. You have created a wonderful look again and this brand looks interesting! This is pretty and the nail polishes sound great. Do you know which stores these are sold in? Absolutely beautiful design! I'd love to see some of your other art too, do you paint?? Not as much as I'd like to... my place is just way too small to house art supplies lol... I need a large studio!! This is so pretty dear! I love the crescent moon shape of the ring finger! their beautiful and daring to have for them done for eid ! it sure does, I was thinking the same thing while painting them :)) Thanks darling!! Have a wonderful weekend, Maryam!!! What a wonderful mani, Maryam!!! Your nails are wonderful!!! And that green is great! Have a nice w/k! Great color combo! Though, silver glitter is a tricky color for me to apply - it takes forever! Thank you so much Ram!! Gorgoeus! I love your manicure! And the nail polish colors are just perfect! Those are some gorgeous nails! I'd love to try that shade of green sometime. How do "3 free" nail polishes compare to regular nail polishes? Thanks love!! They're even better than regular polishes, I've had them on for 4 days now and not a chip in sight!!! I love the nails. They are beautiful! Thank you all so much for your awesome comments!!! Oooh I want that dark green polish!!!! Wow, that looks amazing! You're so talented.